Is Your Pet In The 55%? The ails of humanity are often the ails of our pets as well. Overweightness and obesity are rampant in North America, but across the world the figures continue to be staggering. Perhaps even more astonishing are the rates of obesity and being overweight in our pets. In a national study on obesity in pets in the United States in 2012, some very sombre results were received. Clearly these afflictions do not only affect the human populace, but we also see it regularly in our family pets. What’s most troubling is that it is largely a preventable condition for them that can also lead to even more serious health complications further on in a pet’s lifespan. 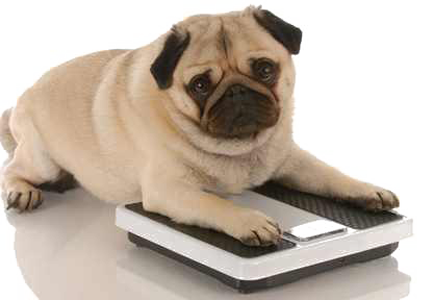 So how do our dogs become overweight or obese, and what can we do to bring them back to a healthy weight? Excessive weight is now common among pets of any age group, but most prevalent in those middle-aged and onward. The most common cause for our pets’ weight gain and obesity is us. Through the encouragement of a sedentary lifestyle that goes against their genetic makeup, along with an incorrectly balanced diet to match their activity levels, the number one reason that pets become obese is their own owners. Excessive weight gain can also be the result of the wrong food choice, such as a high-calorie food, or the granting of too many treats. In each of these cases, the pet takes on more energy in the form of calories than they can expend, leading to the storage of the excess. Whatever the cause of a pet’s excessive weight gain, the cause must be rooted out, for the sake of their health and longevity. What follows is a list of a few of the major issues that a pet owner could be setting their pet up for by allowing them to be overweight and obese. Aside from the obvious horror of knowing that your pet is struggling with their health, imagine as you read your long-term veterinary costs rising higher and higher... Why not switch your pet to a healthy lifestyle to stop these issues before they start? Aside from the ailments noted above, an overweight and obese pet will be generally uncomfortable and struggle with daily activities, including jumping up to surfaces such as couches or chairs or walk up stairs without suffering from exhaustion. An overweight pet will also have a shorter lifespan than a more robust and fit pet, giving the owner less quality time to spend with their beloved animal. A weight-reduction plan starts with a trip to the veterinarian. With guidance from a vet, the correct exercise regimen to increase energy burn as well as the selection of the appropriate low-calorie diet can be found to help a pet achieve a healthy lifestyle balance and shed the extra pounds. This can rarely be done alone, so consult your veterinarian if your pet is overweight or obese immediately, not only to find the right food and exercise plan but to also rule out any serious pre-existing medical conditions. Additionally, many of the best weight-loss foods can only be found at a veterinarian’s office, those rich in dietary fibre and protein, low in fat and with the right caloric balance. For more questions on how to help a pet lose weight and maintain a healthy lifestyle, contact your veterinarian today.